The school’s staff works to ensure that all students will be successful, whether they are entering the workforce directly after graduation or they are enrolling in institutions of higher learning. Over 99% of our students graduate and 98% continue their formal education at two-year and four-year colleges. Roughly 74% of the graduates enrolled at a four-year college, and 24% of the graduates enrolled in a two-year college. The remaining students enlisted in the military or joined the workforce. The school’s vision is to produce graduates who will reflect the Student Learning Outcomes (SLO's). 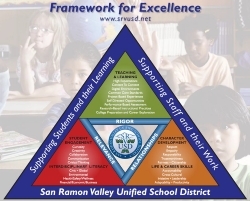 Additionally, in 2011, the San Ramon Valley Unified School Board adopted a district-wide Framework for Excellence: a symbolic representation of how the district is supporting students and their learning, as well as staff and their work. The core of the framework is the 3 R’s: Rigor, Relevance, and Relationships. These three goals are central to the school’s WASC Action Plan and the Single Plan for Student Achievement. 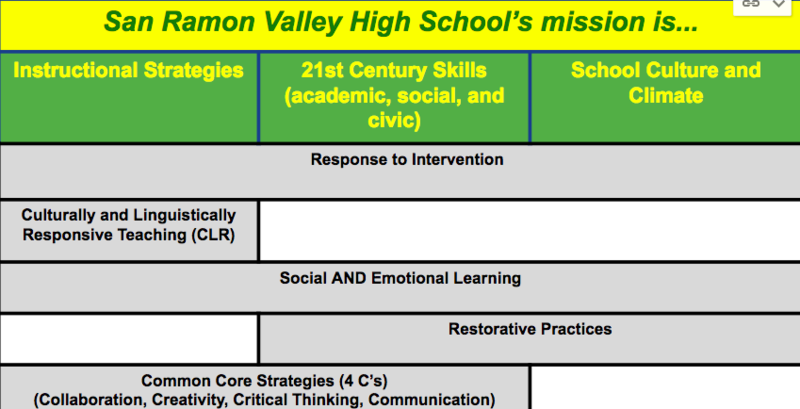 With respect to student engagement, the 5 C’s resonate with the SRVHS community and are the central themes in the San Ramon Valley High School SLO's.